Archaeologists in Bulgaria, digging in the Necropolis of Mesambria in the Black Sea, have unearthed a bronze hydria in a tomb dating back to 4th century BC. 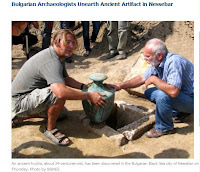 The hydria is glorious in coloration and the first of its kind found at the site, making it a significant find for the Bulgarian archaeologists. According to the scientists, the hydria they found has been used for storing the remains of a dead person who had been cremated first. In their words, the fact that the object is very well preserved and does not need any restoration makes it valuable. The hydria is the first object of this kind to be found in excavations around Nessebar. It would help archaeologists study the funeral rituals of the ancient people who lived in these places. "I have to note that these hydrias were a rarity in the ancient world. They have been made by very crafty masters. They usually have applications on them and are owned by the biggest museums in the world. We are very happy that such a hydria would be presented in the museum in Nesebar," said Aneliya Bozhkova, co-head of the archaeology team doing the excavations.